(CNS): Running in the 100m sprint at the ACC outdoor championships, Cayman Islands athlete Kemar Hyman won the gold medal in Virginia last week. 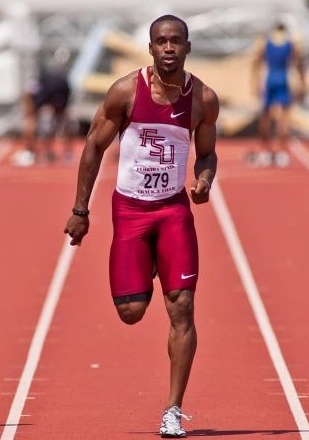 The track star, who runs for Florida State University, crossed the line well ahead of the competition and recorded a time of 10:07, the third fastest time in the sprint for this year, beating his college team mate Maurice Mitchell into second place. Hyman’s victory was also a personal best and a new national record for the Cayman Islands. Hyman will represent Cayman in August at the London Olympics. Well done Kemmar! We wish you well and do not entertain anything negative about Usain Bolt. I know Bolt personally and I know that he will encourage you to keep focused. With that said you can focuse on beating Bolt he would not have a problem with that. Well done Kemar, I watch you grew up on the track. Keep it up son. Soon and very soon, you will have a world record…I believe! I certainly wish him well in the London Games and remember its all about representing your country.Dont let any Nay sayers tell you about Bolt or anyone else.Just do your best as that is all that we can do.Above all enjoy the Games in the Spirit that they were intended to be. Congratulations!! And all the best. He did….unfortunately his time was wind-aided (wind asisted) and technically is not official. Kemar's time was legal and not wind aided that is why it's a new national record for Cayman. Kareem was an excellent athlete, role model and ambassador for the Cayman Islands and made us all proud. So it is wonderful to see the younger athletes like Kemar Hyman and Ronald Forbes step up to the plate to carry on the mantel for Cayman in athletics, along with Sprint Queen Cydonie Mothersill. Congratulations Kemar! We are proud of you and your accomplishments thus far and hope that you continue to strive to higher heights in your future athletic career. All the best at the London Olympics and also at the upcoming Cayman Invitational on May 9th at the Truman Bodden Sports Complex. Kareeme did run a 9.96, albeit after taking some bad advice in regards Nationality. Well done Kemar! A product of Truth For Youth School. Ronald too! Great job, guys! We are very proud of you!